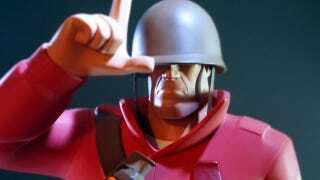 Team Fortress 2 maker Valve and expensive statue maker Gaming Heads are giving fans of video game collectibles more class in the form of the Soldier. He's the latest TF2 member to get a premium statue and he's quite handsome. Gaming Heads has opened pre-orders for the Team Fortress 2 Soldier statue in red and blue tones, both in standard and limited edition options. Each will run you between $220 and $235 USD, depending on your weapon of choice. What are you waiting for, maggots? Get one!